Her Majesty The Queen was present to watch the afternoon action in the Castle Arena, presenting several awards, including the Best Turned Out Trooper and The Challenge Cup and Queen’s Plate for the winners of the Land Rover Services Team Jumping. Daniel Deusser continued his stellar Royal Windsor form to take the pinnacle of the day’s competition, The CSI5* Kingdom of Bahrain Stakes For The King’s Cup with Britain’s Guy Williams taking the evening’s Falcon Stakes, much to the delight of the home crowd. In the Driving, a familiar face sits in pole position of the horse four-in-hand ahead of the cones phase, with eight-time Royal Windsor winner Boyd Exell occupying the top spot. Daniel Deusser and Equita Van T Zorgvliet made it two from two on their Royal Windsor debut, winning the feature class of the day The CSI5* Kingdom of Bahrain Stakes For The King’s Cup. Bob Ellis and Kelvin Bywater’s 1.55m course posed several challenges in the first round, with a difficult line of two doubles catching several combinations out early on and a particularly spooky swan themed fence causing a few problems too. 10 of the 30 starters jumped clear to make it through to the competitive jump-off, which featured many of the world’s best riders. First to go in the jump-off was the class winner from two years ago, Laura Kraut (USA), riding Catwalk 22, who jumped immaculately to set the standard with a clear round in a time of 38.99. Canada’s Tiffany Foster took over the pole position as fourth to go with a particularly tight turn to fence eight, the swans, to shave 1.87 seconds off Kraut’s time; however, her lead was short-lived as Britain’s Robert Whitaker rode an immaculate round, turning especially tight to the double down the final line to take over the top spot. Next into the arena, 2008 Olympic Champion Eric Lamaze (CAN) showed that the time could be beaten, riding a very fast round, but the twelve-year-old gelding Chacco Kid clipped the vertical going into the final double to finish on four faults. With two former world number one riders still to come, Whitaker’s lead was never secure, and Kent Farrington (USA) came close, his nimble chestnut gelding Creedance covering the ground quickly, but with slightly wider turns they finished 0.03 seconds slower. As last to go, Daniel Deusser, riding Equita Van T Zorgvliet, retained his top form, making all the turns and striding out between the fences to post an exceptional time of 35.51 and take the victory, lining up a meeting with Her Majesty The Queen, who presented The King’s Cup to the winner. The highlight of the evening performance, the CSI5* Falcon Stakes, provided top class entertainment with the world’s best riders back in action. Speed was a major factor from the start, with only 10 places available in the jump-off, it was only the fastest of the 16 clear rounds from the first round that made it through. The top ten then returned in reverse order, with the advantage falling to USA’s Laura Kraut as the fastest clear in round one to be the last to go in the jump-off. Qualifying in tenth position, Italy’s Emanuele Gaudiano was first to tackle the shortened jump-off course and put the pressure on from start, with his foot flat to the floor throughout and smooth tight turns posting a clear round in 35.75 seconds. Britain’s Scott Brash followed him into the arena and immediately took over the lead with an incredibly slick round, saving time with the tightest of turns, to record a time of 35.40. The lead changed several times before the end; first it was Steve Guerdat from Switzerland, who flew straight out of the gate, making up time across the ground to overtake Brash, with William Funnell (GBR) coming close too, but it was Britain’s Guy Williams as the penultimate to go, who took the victory. Riding the thirteen-year-old stallion Rouge De Ravel, Williams kept up the pace throughout and pulled off an exceptional turn to the Hermès vertical at the far end to make up 0.36 seconds on Guerdat. India Till scooped the biggest prize of her career so far when her 128cm show pony, Rotherwood Rainmaker, landed the coveted Martin Collins Enterprises Show Pony Championship title, one of the most sought-after accolades on the pony Showing circuit. A former Horse of the Year Show (HOYS) reserve with previous jockey Poppy Carter, the exquisite bay has introduced India to top flight showing, still produced by Poppy’s mother, Katy Carter. Reserve went to the 148cm victors, Phoebe Price and her 2016 HOYS champion and last year’s HOYS class winner, Litton Enterprise, a 12-year-old produced by Julie Templeton. The Novice Show Pony Championship title is equally sought-after. This year it fell to Robert Walker’s son Sam, who celebrated his 14th birthday five days earlier, with Julie Rucklidge’s homebred five-year-old 138cm class winner, Jackets Dynasty, also produced by Julie Templeton. 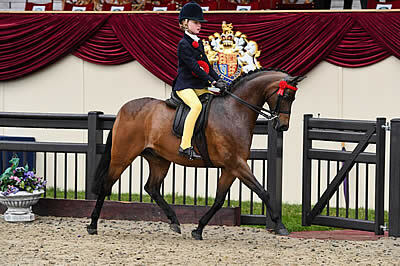 The charming bay mare is following in illustrious footsteps, as both her dam, Jackets Maybee, and granddam Jackets Maysong won at Royal Windsor and went on to triumph at HOYS. After some strong classes, the BSPS Mountain and Moorland Ridden Championship — and coveted ticket to the Heritage Finale at Olympia, The London International Horse Show in December — went to Becki Penny with Lynn Scott’s ultra-consistent homebred Welsh section C stallion, Lynuck The Showman. Two Connemara ponies dominated the popular Mountain and Moorland Working Hunter Pony classes. Riverside Daffodil, owned and ridden by Renee Nichols, jumped a super round to head the exceeding 143cm division and stand champion, ahead of the exceeding 133cm but not exceeding 143cm class victor, Hearnesbrook New Moon, owned by Phyll Buxton and ridden by Ella Dalton. In horse four-in-hands, the leader – reigning world champion and winner here eight times – Boyd Exell (AUS) drove surely and confidently in wet conditions, recording the fastest time in five of the obstacles. He won this section and increased his lead to an impressive 20 penalties. His closest challenger at this time is Belgium’s Edouard Simonet whose careful marathon – he was third in the phase – moved him into second place overall, from fifth after the dressage. Father and son competitors from the Netherlands, Ijsbrand and Bram Chardon, the latter competing in horse four-in-hands for the first time here, moved up the leader board to take third and fourth places, respectively, less than one penalty separating them. Horse pairs saw a change in leader when second placed Beat Schenk from Switzerland moved up to first place ahead of France’s Franck Grimonprez, a member of France’s bronze medal winning team at the 2017 World Horse Pairs Championships in Slovenia. Germany’s Sebastian Warneck, a silver team medallist in Slovenia last year, moved up a place to third. Positions changed, too, in pony four-in-hands. Overnight leader Tinne Bax (BEL) dropped from first place to third, while Great Britain’s young pony four-in-hand competitor, Roger Campbell, drove an outstanding marathon to win this section and secure him second place ahead of the cones phase. He is less than three penalties behind the new overnight leader Jan de Boer from the Netherlands, who has six previous wins at Royal Windsor with his team of Welsh ponies. Tickets for Royal Windsor Horse Show are still available via www.rwhs.co.uk.